Real Madrid are set to take on Espanyol in the Spanish La Liga game on Tuesday night, 27th February 2018 at the RCDE Stadium in Barcelona. Madrid go into the game 14 points behind league leaders Barcelona and title race is pretty much settled as far as Madrid’s chances are concerned however there is a little matter of finishing second behind the winners with atletico Madrid also fighting for the place currently sitting second with 58 points. 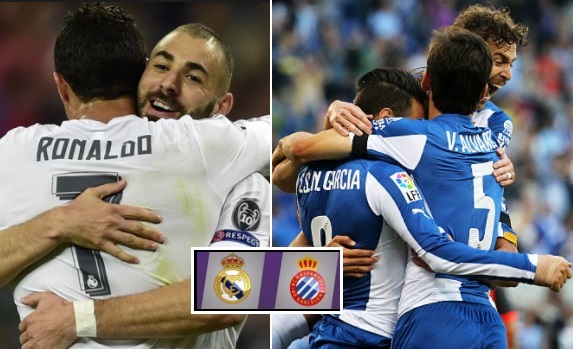 We will have full match highlights of Real Madrid vs Espanyol right here after the game is over. Real Madrid seem to have turned to corner in February and now they sit comfortably third in the table compared to January when they were fighting for top four finish. They are doing pretty well in the Champions League having won the opening leg of their Round of 16 clash against PSG and another win on Tuesday night will only enhance their chances of finishing the season strong. Zidane is no longer under severe pressure although the league title is out of Madrid’s hands and they are knocked out in the Copa Del Rey as well however their usual form in the Champions League continue and that might be the saving grace for Zidane and this Real Madrid side. If they can see off PSG and reach quarterfinals and they way they are playing at the moment will make them favourites. Espanyol on the other hand are not doing very well this season and historically they have struggled against Madrid more often than not. They have only won 5 of the 13 home games so far and Madrid should aim to get all three points in this fixture. Match predictions: Real Madrid are playing some good football at the momeent and looking at both teams form its hard to see Madrid dropping points in this one. I am going with a comfortable 3-1 win for Madrid with Ronaldo and Benzema both getting on the scoresheet.